See how the oil sits on top? 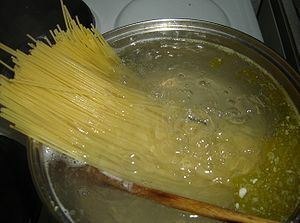 Do not put oil in pasta water, it just goes down the drain. Oil pasta after cooking. Here is another assumption I made. Since your father is Italian, and you grew up eating pasta, I assumed you knew how to cook it. Boiling pasta is really quite simple. You need to use a pot big enough to hold enough water to cook the amount of pasta you need. Err on too much water rather than not enough water. Bring the water to a boil. A boil is when the bubbles actively break the surface. A boil measures 212°F (100°C) on a thermometer. A lid on the pot will help water boil faster. If you live in a high altitude (like the mountain house) water won’t boil without a lid, and the boiling point decreases 1° every 500 feet in elevation (or 1° C every 285 meters). it has everything to do with atmospheric pressure. Actually, boiling point is quite a science subject. 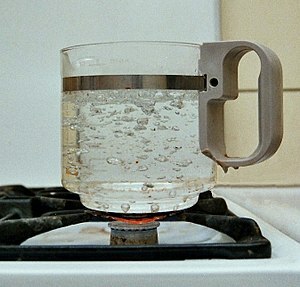 Always salt the water AFTER it reaches an active boil. In the science community, adding a solute to the water creates a solution that raises the temperature of the boiling point. Scientists will argue that it is not necessary to add salt because the amount of increased temperature isn’t worth it to ‘cook faster’. This is not why we add salt. We add salt for flavor. We add salt after a boil is reached so the salt does not pit our pots over a lifetime of poor cooking habits. Most of all, we add salt to things we boil for flavor. Boiled potatoes are ever so bland when salt is left out. The amount required isn’t much, just enough to lightly flavor the water. Be aware, when you add salt to boiling water, the water will flare up momentarily. Be ready for it to avoid getting burned. 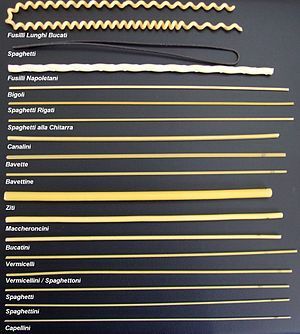 Choose your favorite pasta and read the package it comes in. Look for cooking directions for the time it takes to cook the pasta to “Al-dente“. Each pasta will have different cooking times. Place the pasta in the pot, stir it up so it does not stick together. If using a long pasta, don’t break it so it fits in the pot! Short strands are hard to twirl onto the fork. Lean the noodles up against the side of the pot and using tongs, as the pasta under the water softens, fold the rest of the pasta under the water. 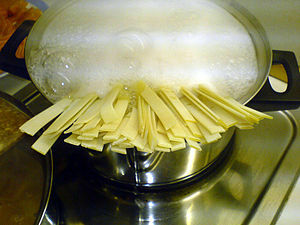 Be sure to stir it all around so nothing gets stuck either to other pasta strands or the bottom or sides of the pot. This is especially true of fettuccine or linguine and other flat pasta. Set a timer fort the required time. 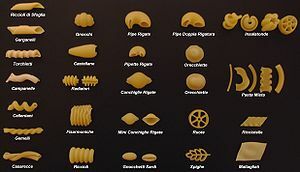 If cooking fresh pasta, the time will be very short, dried pasta takes longer. 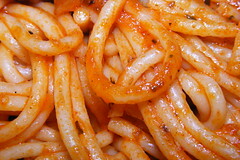 Drain the pasta in a colander and try to save about a cup of the pasta water. Did you notice there was never a mention to put oil in the water while boiling? Ha! That is because the oil sits on the top of the water while the pasta is below the water. It does nothing to keep the pasta from sticking together. Stirring the pasta after you first put it in the water does. After draining, put the pasta into a serving bowl and drizzle with a great olive oil. If you are going to use the pasta in a salad or need it cold, rinse the pasta in cold water after draining to stop the cooking process. Drizzle with olive oil to prevent sticking. If the pasta gets dry or you need more moisture in your sauce, add a small bit of the pasta water. This is why you do not want to over salt the water. Only salt it enough to make it taste good. If you want to re-heat pasta that has been refrigerated, simple bring water to a boil and dip the pasta in for a minute or so, just to warm it, not cook it. This can be done in a small amount of water. Drain and serve as desired. This works for all kinds of pasta, semolina, whole wheat, rice, artichoke, quinoa etc. Read the package for length of cooking time. Pasta is a great budget stretcher so learn to cook it correctly. Boil the water – use lots of water! Drain, rinse in cold water to cool and drizzle with oil. This entry was posted in basic skills, Cooking, To Tyler: How to Cook:, What every good cook should know and tagged Al dente, Boil, cook, dinner, food, Italian cuisine, Olive oil, pasta, pasta water, Water. Bookmark the permalink. The most common problem is not using enough water and not stirring. Hope you try it again. Another great tip to prevent the water from boiling over is to rub the rim of the pot with oil – it really does work, promise. I will try that one, Thanks Mandy! Great tip. 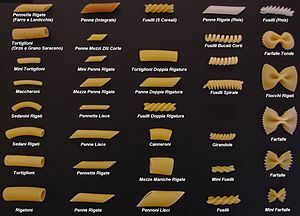 The different kinds of pasta are so much fun. I love buccatini, but don’t know why it is so hard to find. I hope you can find it easier soon. Keep asking for it! So nice to “see” you again Barbara! I hope you brought back lots of stories and pictures of wonderful Italy.